Home - Jane Doe // Gaming Collective - Enjin - Team Leg Sweep Server Turd! Team Leg Sweep Server Turd! With the brilliant leadership of the glorious G̶r̶a̶e̶g̶e̶n̶ Jasirfir Champion of LS, Team Lusty Skunks downed Vectis Mythic and is now sitting at a comfortable Server third! And if rumors are to be believed, Jane doe might end up with "Server first" and "Server Second" for this very tier! Laughable Reindeers recent kill of Mythic Zul, Reborn. by Roggles. Well done LS and great job JD! Happy New Year, guild mates! Happy Holidays everyone. Have a good christmas and new year and il see you in 2019!!!!!! Ah. Flazhbang, we meet again! Mjellow Luxx, Thats is precisely what a shout box is here for. Finally someone got it! Its nice to see the guild as active as it is. In the process if finalising the 3 raid teams, Thats about it really. Lots of questing and levelling. BfA keeps everyone super busy! Any news? I really should invest in one of them kids for manual labor. Anyone got a spare? Awesome news about the merge, good to see long standing guilds like this work together. Yep - grats on Aggra, and Realm Rank 2!!! Grats all with the Myth Aggra kill! Coven is down Monday LR,I can feel it for sure!!. I think he switched realms? oh yeah! Completely forgot about Taye - whatever happened to him? Taye was leading it back then. Hey EOL. Do you clear normal before moving on to HC? I remember that fight!! Was awesome. Can't remember the name of the team though! Riggman!!! What was the name of your team back in times of Bastion and Firelands? And Chiri, are you same person who was in that team and same person who was helping Rupture to down End boss of Dragon Soul? 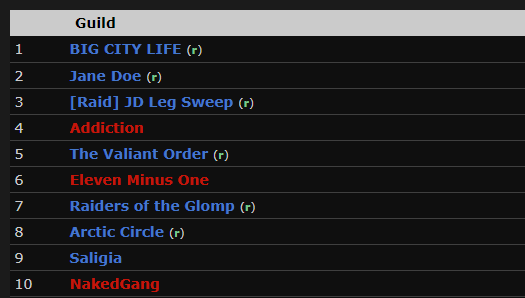 This week Funrun hits Uldua Timewalking! :/ Well next week then! Hey. Is there fun run tonight? Jas give us the awesomenes of Christmas Hounds! Gratz on the kill LR. Well done! Juuri, its called PlayerUnknown's Battlegrounds. It is a battle royale type game. Ehm Juuri, twins? am i gonna be an uncle again??? If so, big grats man, you two are working 10 times more then our government !! Anyone else noticed release date of Argus raid is birthday of Argusmonte?! Wtf is going on? Did Argus got hired to Blizzard when he disappeared?